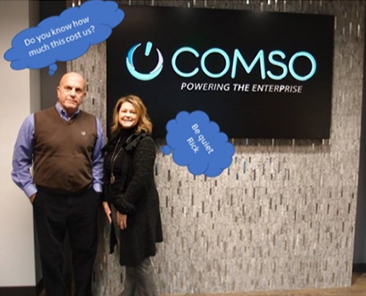 On Friday, January 26th, COMSO headquarters moved from our Greenbelt home since 1993, and on Monday, January 29th, COMSO was open to business in our expansive new offices in Suite 110, 7075 Samuel Morse Drive in Columbia, Maryland. The new suite is over 10,000 square feet, with 17 sunny offices, a large open space with 18 cubicles, a spacious open kitchen with gleaming new appliances, four conference rooms, a recreation room, and a gym right next door. Rick and Jacqui in front of the COMSO stone wall in the reception area. Owner Jacqui Magnes, who has a passion for interior design, was the artistic genius behind the design and execution of the offices. Her creative design skills and superb craftsmanship are evident in everything from the reception area to the floors, artwork, furnishings, and the repotting of the decades-old and well-loved COMSO Schefflera. The décor is eye-catching steampunk and contemporary rustic, with murals of hand-picked photos of Baltimore, Maryland; Washington, D.C.; Augusta, Georgia; Denver, Colorado; and Hawaii, representing our current customer sites. Jacqui and her husband Bruce Howard built the stone wall in the lobby and the reclaimed lumber corner wall in the kitchen, and Jacqui refinished old tables and consoles in imaginative ways. CFO and facility manager Rick Passalacqua was instrumental in the execution of Jacqui’s vision. Rick was “money man” and move planner and coordinator, and with the help of his staff, Rick spent months cleaning out, organizing, and discarding tons of paper, old furniture, and the detritus accumulated in 29 years of COMSO office life. He met with moving companies and business office managers and oversaw the winding-down of the Greenbelt office lease as well as the negotiation of the new Columbia office lease. The entire operation was so organized and well-planned by this dynamic duo that it was amazing to witness. Next on their agenda: an open house for customers, employees, and friends of COMSO.